Mr. Dad taught me how to ride my bicycle when I was nine, I was fourteen when he taught me how to drive his car, I was sixteen when he made me in charge of depositing his pizzeria's cash receipts to the bank, and I was twenty when he let me pack my bags and move back to America all by myself. My father is an Iranian father, he grew up in a traditional home with traditional Iranian values, and not once in my life he made me feel that had I been a boy I would have had certain privileges that I didn't as a girl. My mother may have pushed me to study hard to succeed in my education in order to become independent by constantly counseling me whenever I got a bad grade, but I would not have become the strong person that I am today if it was not for my father who by his conduct, not his words, made me feel I could achieve anything I ever wanted. And so, on this father's day I am making his favorite dessert, faloodeh, which is a famous summertime dessert in Iran originally from the beautiful city of Shiraz. 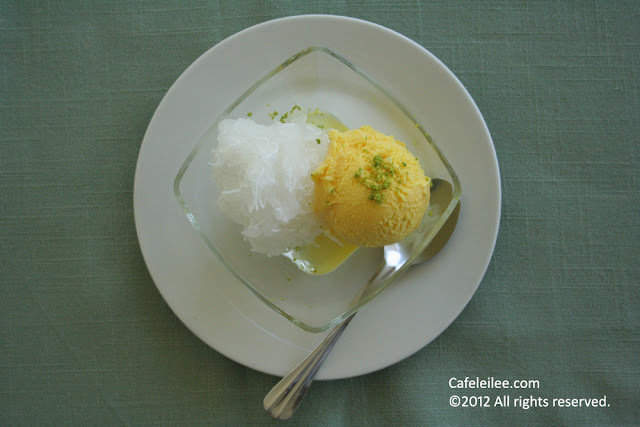 Another version of serving this granita like dessert is along a scoop of saffron ice cream in which case it is called makhloot. I am indebted to my aunt Malak for sharing this recipe with me. In a medium size saucepan bring the water and sugar to a boil until the sugar has dissolved. Add rosewater, and turn off the heat. Let the syrup cool to room temperature then place in a shallow dish and place in the freezer. Let the syrup freeze for at least 6 hours, preferably overnight. 30 minutes before serving, bring a large pot of water to boil season lightly with salt and add the rice sticks. reduce the heat and let the rice sticks cook for about 15 minutes. Drain the noodles and rinse with cold water until the noodles are cold. 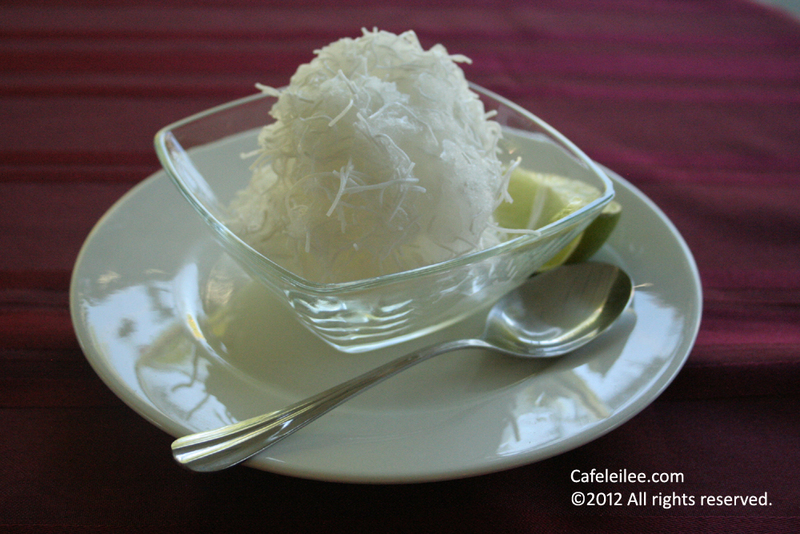 To serve, use a fork to scrape the frozen syrup and gradually add the cooked rice sticks and mix with the granita. Make sure to add the noodles in small batches to ensure they freeze properly. The noodles need to get harden and very white. Serving suggestion: Faloodeh is served in three ways, by itself, or with a drizzle of lemon or lime juice, or drizzle of sour cherry syrup. Note: If you are not going to serve the whole thing immediately, you can store the cooked noodles in a container filled with cold water for up to 3 days in the refrigerator. Just drain before serving and mix with the granita. آقای پدر دوچرخه سواری رو وقتی نه سالم بود به من یاد داد، وقتی چهارده سالم شد به من یاد داد که ماشینش رو برونم، وقتی شانزده سالم بود من رو مسوول واریز کردن پولهای پیتزاییش تو بانک کرد، و وقتی بیست سالم بود به من اجازه داد که بارم رو ببندم و تنهایی به آمریکا بر گردم. پدر من یک پدر ایرانی هست که توی یک خانواده سنتی با ارزش های سنتی بزرگ شده، اما هیچ وقت تو زندگیم به من این احساس رو نداد که اگر یک پسر به دنیا میومدم امتیازاتی رو داشتم که به عنوان یک دختر ندارم. خانم مادر تمام عمرم تو گوشم خوند که درس بخونم و توی درس موافق باشم تا روی پای خودم بایستم، اما اگر به خاطر پدرم نبود هیچ وقت اون آدم مستقلی که پدر مادرم میخواستن بار نمیومدم. پدری که با اعمالش نه با کلماتش به من نشون داد که تو زندگیم به هر چی که دلم بخواد میتونم برسم. از اونجایی که امروز تو آمریکا و خیلی کشورهای دیگه روز پدر هست من هم دستور دسر محبوب آقای پدر که فالوده هست رو اینجا پست میکنم. دستور این فالوده رو مدیون خاله ملک عزیزم هستم. در یک ظرف لعابی متوسط آب و شکر را جوش بیاورید تا شکر حل شود. شربت را از روی شعله بر دارید و گلاب را اضافه کنید. بگذارید شربت به دمای اتاق برسد سپس آن را در یک ظرف کم عمق بریزید و در فریزر قرار دهید. بگذارید در فریزر برای حد اقل ۶ ساعت یخ ببندد، بهتر است که شربت را شب تا صبح در فریزر بگذارید. نیم ساعت قبل از سرو کردن یک قابلمه بزرگ را پر از آب کنید و با کمی نمک به جوش بیاورید. رشته برنج را اضافه کرده برای حدود ۱۵ دقیقه رشته را بپزید. رشته ها را آبکش کنید و با آب سرد آنها را خنک کنید. شربت یخ زده را از فریزر در آورید و با چنگال بتراشید، رشته ها را کم کم به شربت یخ زده اضافه کنید و مخلوط کنید تا رشته ها هم یخ بزنند. رشته ها را کم کم اضافه کنید تا مطمئن شوید که رشته ها یخ زده اند. رشته یخ زده خیلی سفت و سفید میشود. نکته: اگر همه فالوده را نمیخواهید سرو کنید، میتوانید رشته های پخته را در ظرفی که تا نیمه آب ریختید درون یخچال تا ۳ روز نگه دارید. فقط قبل از سرو کردن رشته ها را آبکش کنید. Who knows whether it is possible to do the same with rice? I am now on a diet but like diversity. I recently bought small rice cookers and is now experimenting.